Little Johnny Rivero, myself, Richie Gajate Garcia, Ricardo Catala, Giovanni Hidalgo, Bobby Sanabria, Pablo "Chino" Nuñez, Christian Rivera and George Delgado. 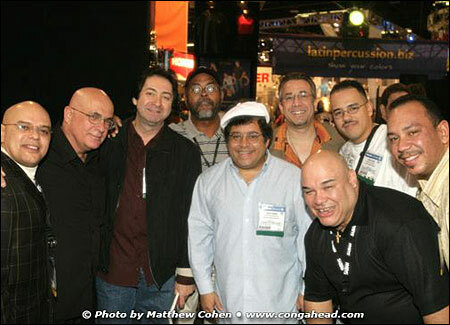 Winter NAMM 2005 was a special experience for my family and I. My son Matthew has come into his own in the music industry, eager to work at the LP® hospitality kiosk and to assist in the photography of the talent that make the LP exhibit a must-see element of the show. My wife Vivianne, loved by so many who are eager to be photographed with her, makes everyone who comes by the LP exhibit feel at home. This year we all were delighted to have the great Carlos Santana as a visiting speaker, lending his support to the growing number of LP products that carry his imprint. 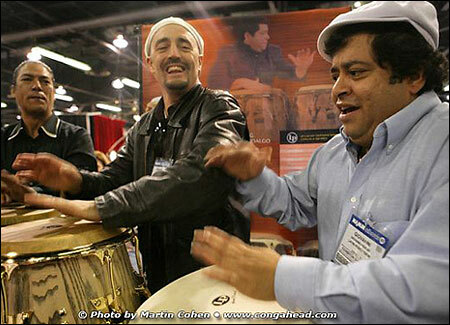 Latin Percussion, the world's number-one brand in percussion, had many of its top endorsers visit to jam and sign autographs. Among the visiting musical dignitaries were drumming legend Steve Gadd, now an LP artist, and Austrian-born Joe Zawinul, who proved in the 1960s that it wasn't the color of your skin that mattered when he wrote "Mercy Mercy Mercy." Joe became a life-long master of soul, and went on to create Weather Report and produce the music of the great African singer, Salif Keita. Raul Rekow, Edgardo Cambón and Giovanni Hidalgo.